A messy bee and some pollen. We live at a time when the federal government is removing climate change data from the EPA’s website, withdrawing from climate accords (the anniversary is upon us! ), and then there’s this lunatic—yet scientists are still somehow soldiering on. This week signifiant research was published on the increasing severity of allergy season, the aggravating effects of climate change, and how this phenomenon will probably only get worse. 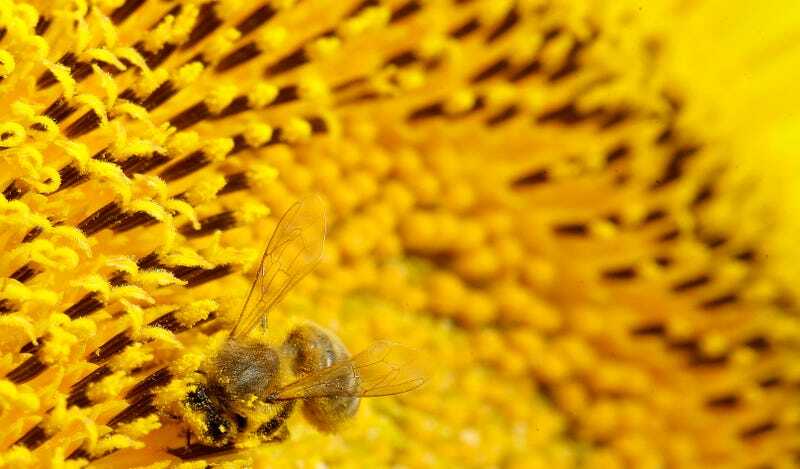 NBC News reported on Wednesday that the American Academy of Allergy, Asthma and Immunology found that there’s been a sudden, sharp, unprecedented increase in the number of people suffering from seasonal allergies, and that those living in the northwest and southwest have been hit hardest. In addition to more individuals suffering the symptoms of allergies, like itchy eyes and general congestion, researchers found that those symptoms are lasting for greater periods of time, with some symptoms lasting as much as 27 days longer than before. The report suggests that warmer, wetter winters brought on by changing weather patterns a.k.a. climate change have led to higher levels of pollen in the air lingering for longer periods of time. Dr. Clifford Bassett, the medical director of Allergy & Asthma Care of New York, told NBC News that millions of Americans have been affected by the “allergy explosion,” to which climate change has been a contributing factor. “Climate change, globalization, air pollution, and over-sanitization of the environment in the early years of life are just a few of the causes that, taken together, have introduced new allergens into our environment causing needless suffering,” said Bassett. Also, let me just add how much I love that in most every aggregating write-up of this phenomenon the phrase “researchers blame climate change” is employed, as if science is holding some kind of grudge against the weather. Just write “researchers say, conclude, point to, suggest”—whatever. This isn’t one of those made-to-go-viral studies about how SoulCycle may lead to less intense orgasms, or chocolate to a career path you are not quite as suited for. It’s as if our very atmosphere is starting drama with us, literally and otherwise. NBC’s write-up suggests combating this scourge of airborne pollen by wearing oversized, even wraparound sunglasses, or a hat.